You've seen me write on THE MUMMY. So you already know what this is about. Say what you want about the apparent stumble of the cinematic universe of classic monsters. The fact is THE MUMMY did make a respectable $407MM worldwide despite savage ravaging from critics. Fact is I quite enjoyed this version of the movie monster. Of course, that may be on account of my complete adoration of the classic movie monsters as a whole and that I'm not some critic or stickler for certain actors, ideas, or whatever. Of course, you can't bank on star power to make a movie a hit, and that's evident with the most recent news that production has paused with the film removed from the slate until further notice. Even the crew was told to go home. Both Bardem and Jolie are pretty much holding out for the official word, which could mean that at the very least Jolie might pull herself from the role given she's also slated for Disney's MALEFICENT 2, so there might be some scheduling conflicts (hence why Condon's eyeing Gadot for it). 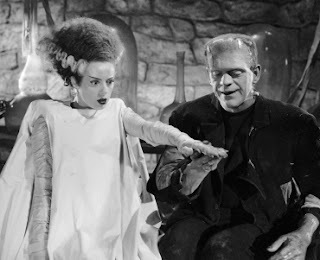 The word is, though, that reasons for postponing BRIDE OF FRANKENSTEIN isn't necessarily about THE MUMMY's apparent critical failure (even though this article talks at length and speaks the truth about subjectivity of all sorts of film reviews) inasmuch as it's about just "getting it right" and ensuring the Dark Universe gets more of its footing. After all, I can admit it: THE MUMMY was a rocky start (not a bad start, though). in the day. Better than the original Frankenstein. Better than even Dracula. So you can't take this lightly. The postponing was due to taking on more work in developing the script even more. In other words, Universal wants to not "move too quickly to meet a release date." I get that. Totally. And they certainly want to ensure they utilize Condon to the best of his ability.... After all, he did win the Oscar for writing GODS AND MONSTERS, a real character study on the original director of the classic Frankenstein film, which meant good ol' Bill took a lot of time studying the man behind the 1935 movie. Plus the word is this version of BRIDE OF FRANKENSTEIN will be very much a period piece and not a modern retelling (which I believe is the right way to go), hence you're definitely going to see that this isn't necessarily connected to THE MUMMY inasmuch as it's still going to be linked directly to the Dark Universe (so you're most definitely going to see Frankie and the bride in future Dark Universe films, perhaps acting alongside Mr. Tom Cruise as the Mummy and Russell Crowe as Jekyll/Hyde, maybe?). After all, imagine it.... A dark period piece on the bride and the monster. Rated R. Terrifying. Rich with ambience. A true frightener of classic art-house style. I do like the sound of it. And I look forward to it.